Boise State University Alumni Building — The Land Group, Inc. The idea for the site design for Boise State University Alumni and Friends Center was to create an environment that would ignite school spirit, rekindle lifelong friendships, and create future memories. The Land Group worked closely with the clients to identify different event and courtyard spaces. This design opened the building frontage along West University Drive for large events, while providing a semi-private courtyard for small group gatherings at the corner of South Denver Avenue and West University Avenue. 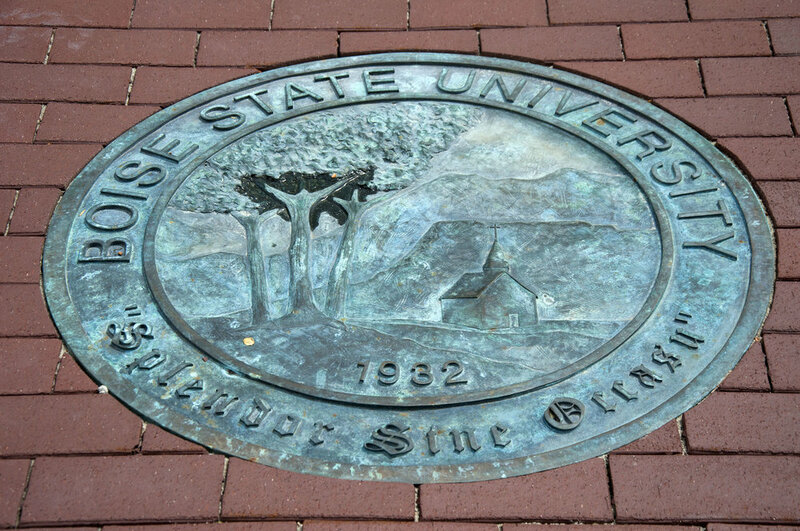 The alumni building is home to great pieces of art created by Boise State University alumni, faculty, and friends; the exterior space also functions as an outdoor gallery. The semi-private courtyard features a 6-piece Totem made by an award winning local artist, Rod Kogan. The semi-private courtyard also features a bronze cast of the university’s seal set into the concrete and an area for brick pavers featuring the names of donors. The Land Group’s effort went beyond designing a unique and memorable site, to preserving and protecting local environmental quality. A majority of the existing maple and ash trees along South Denver Avenue were protected throughout the construction process and incorporated into the final design. Additionally, permeable pavers were used in the parking lot area to reduce stormwater runoff rates and volume.